Sapphire Beach Condominium Resort is one of St. Thomas's finest all-suite properties, located on one-half mile of one of St. Thomas's most beautiful beaches. To view our suites, take the Sapphire Beach Photo Tour. Enjoy private balconies, and full kitchens with large living areas. All units have air conditioning, safes, cable TV, ceiling fan and phones. 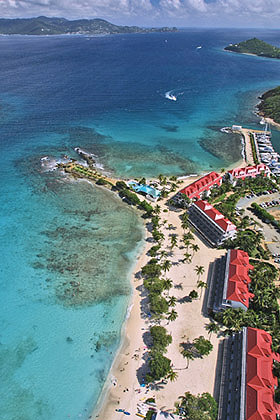 Sapphire Beach Resort is located one mile from the town of Red Hook on the eastern end of St. Thomas . Red Hook provides all conveniences and grocery shopping, along with many additional dining options. Ferry service to St. John and the British Virgin Islands is also available from Red Hook. The resort is right on beautiful Sapphire Beach. 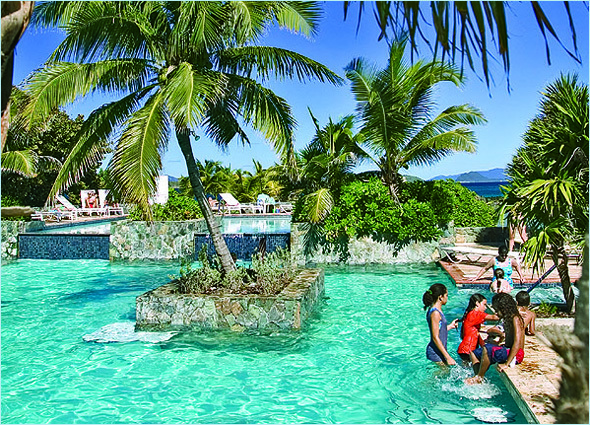 The multi-level cascading freshwater pool overlooks the Caribbean Sea. Your family will enjoy spacious living and dining areas, and beautiful outdoor balconies. See our Yacht Harbor Suites, Beachfront Suites, Yacht Harbor Villas and Beachfront Villas in the photo tour. See floor plans and information in our Sapphire Beach Rooms and Suites page.